Karachi continues to bleed & burn within an Islamic Grace. KARACHI: The Sindh government authorised the Rangers on Friday to exercise the powers of police officers to ‘use necessary force to prevent terrorist acts’ as steps promised and taken hitherto failed to stop killings in Karachi and 30 people lost their lives on the fourth day of violence, raising the death toll to 93. The Qasba Colony and adjoining areas remained the worst affected, although the violence spread to the southern and eastern parts of the city and grenade and rocket attacks were also reported. Scattered arson attacks left at least eight shops burnt in Aligarh Colony and a commercial centre in Kharadar met the same fate. The violence that has so far remained beyond the control of police and Rangers forced residents of Qasba Colony and adjoining areas to flee to safe places. A Sindh Rangers spokesman said personnel of the paramilitary force had helped evacuate hundreds of people trapped in strife-torn areas. “We are moving the families to safe places and the exercise continues. 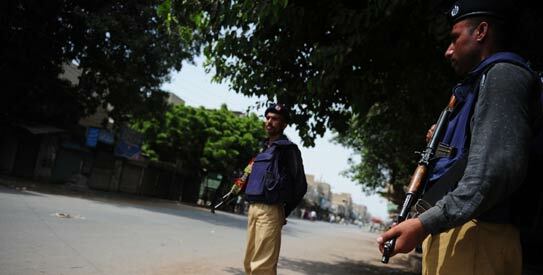 Rangers troops helped mainly people in Qasba Colony and adjoining areas,” he said. 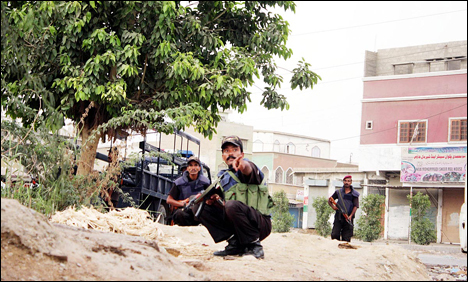 A grenade attack in the congested commercial area of Bheempura claimed three lives and rocket attacks on houses in Baldia Town spread panic in the densely-populated neighbourhood. Courtesy : Dawn || AFP || AP || YouTube.